RIZIN held a press conference and an open workout today to announce the MMA debut of amateur wrestling ace Kanako Murata. She actually announced her intentions at the first RIZIN show. Her opponent for the Apr. 17 show was announced today. Kanako is 22 years old and she is a student at Nihon University in Tokyo. She was a 2011 and 2012 Junior World Champion. She last competed in 2013 and there was some talk about going to the Olympics. But as an amateur wrestler in Japan, she is always going to be overshadowed by the legendary Saori Yoshida. So it's ironic that Yoshida has been hired to recruit amateur wrestlers to RIZIN. 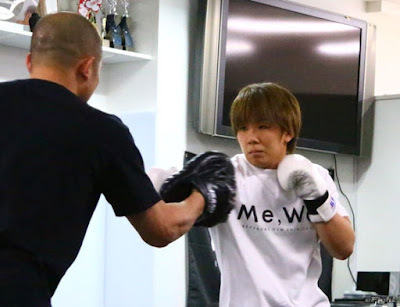 Kanako is training with former DEEP Featherweight Champion Kazunori Yokota. Her opponent is Russian Natalya Denisova. Natalya is a teammate of Anna Malyukova who will fight Gabi Garcia on this show. They are both from Penza, Russia and both fought on the same show last September. That saves on travel costs. Her MMA record is 2-1. Apparently Natalya's father was a boxer and she has been training martial arts since childhood. So we have a classic wrestler vs boxer battle. It could be interesting.